Tim’s new book “The Human Blip: The Cosmology of Tim” is a philosophical, in-depth work that delves into the meaning of life and faith. Recent release “The Human Blip: The Cosmology of Tim” from Page Publishing author Tim is both captivating and cultural; this work explores the ideas of personal identity and finding one’s self. 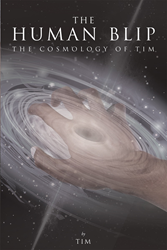 Tim, a prior news editor, devoted writer, philosopher, and author, has completed his new book “The Human Blip: The Cosmology of Tim”: a gripping and potent work that tries to reconcile religion and science. Published by New York City-based Page Publishing, Tim’s enlightening work explores the author’s physical, psychological, emotional, and spiritual experiences. Here, in one almost shockingly succinct tome, lay all the answers for which readers have been searching. Not just why are we here, but where else have we been, or will we go? All with an eye toward 21st-century science rather than first century delusions. Readers will want a spare copy for a friend. Spread the word. Readers who wish to experience this unique work can purchase“The Human Blip: The Cosmology of Tim” at bookstores everywhere, or online at the Apple iTunes store, Amazon, Google Play or Barnes and Noble.